We make a whole range of deli products in our shop daily. Our deli products are very popular for easy entertaining and can be made to order. All our hams use local pork that has been dry cured. Our hams are cooked on the premises and can be bought smoked or unsmoked, in slices or as whole gammons. We can slice to any thickness from a ‘shaving’ to a ‘chunk’, let us know your preference on ordering. 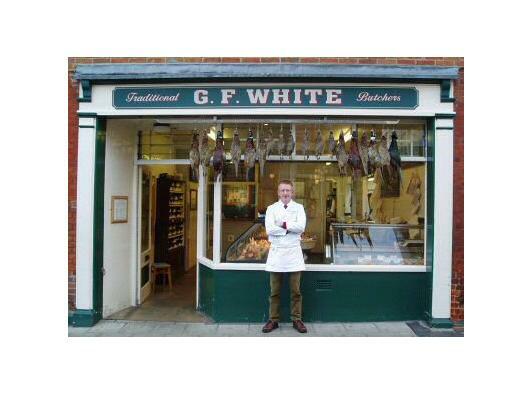 G.F.White is a Traditional Family Butchers based in Aylsham, Norfolk. We specialise in Meat, Game and Poultry. Meat has been our business for three family generations and we prepare many of our products to traditional family recipes. Our aim has always been to produce good quality products, so we take pride in the sourcing, hanging, and preparing of our meat. Meal times are an essential part of our everyday lives, and whether you are looking for a quick weekday meal solution or a special cut to entertain friends and family we can provide you with a product that you can trust to deliver a tasty solution. There are thousands of different cuts of meat and even more ways we can prepare it: cubed, diced, sliced, salted, smoked, minced, boned, rolled, stuffed... the list is endless. There are also many terms to describe the same thing. Don’t get confused by the choice. Give us a ring and tell us what you want to cook, how you want to cook it and what your budget is and we’ll recommend the best meat solution.